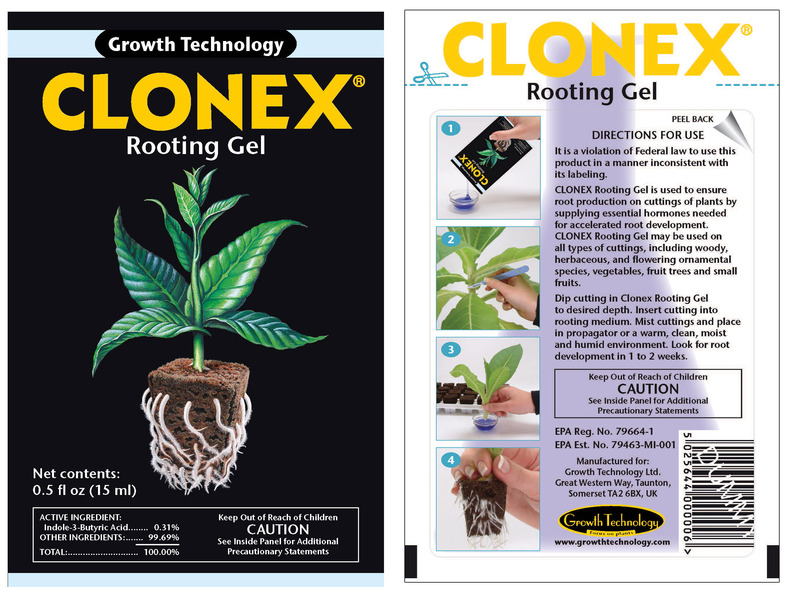 Clonex® Rooting Gel is widely recognized as an industry standard for its ability to meet the successful and consistent results required for propagation done with vegitative cuttings. Clonex Rooting Gel is registered with the EPA and is approved for use on all food crops, including medicinal plants, in all 50 states plus Washington DC and Puerto Rico and is the only rooting gel approved by the Colorado Department of Agriculture for propagating medicinal plants. Download the Clonex Propagation Guide. It’s full of information on how to take a cutting, how and when to use Clonex products, plus it covers mother plants and transplanting. Clonex Rooting Gel is a high performance, water-based, rooting gel developed by Growth Technology™ Ltd. It is a tenacious gel which will remain in contact around the stem, actually sealing the cut tissue and then supplying the hormones needed to promote root cell development. It is manufactured under strict pharmaceutical laboratory conditions and is, consequently, years ahead of old fashioned hormones and powders. 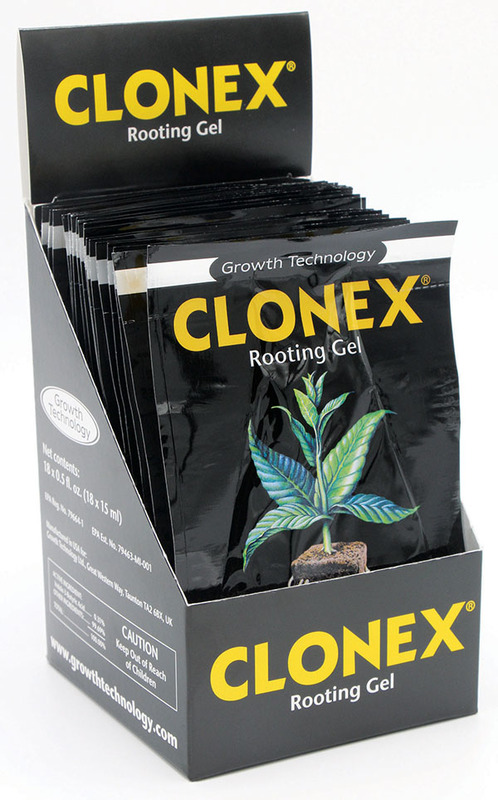 Since 1988 Clonex Rooting Gel has led the way in plant propagation with billions of clones successfully rooted, including virtually every species of plant known to man. 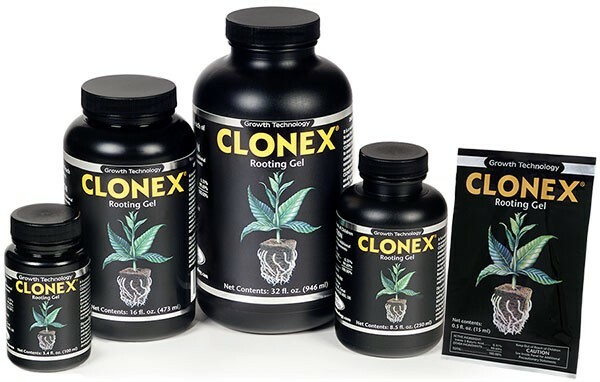 The Clonex formulation has been fine-tuned to give the explosive root development and for this reason serious growers and plant nurseries depend upon it for successful and profitable plant propagation. It is completely alcohol-free. It is available in 15ml single use packets, as well as 100ml, 250ml, 16 ounce, and 32 ounce wide mouth bottles. One 15ml single use packet treats approximately 50 plant cuttings. First, dip cutting in gel to desired depth. Then insert cutting into rooting medium. Mist cuttings and place in propagator or a warm, clean, moist and humid environment. Finally, look for root development in 1 – 2 weeks. As a matter of fact, you can use Clonex Rooting Gel on all types of plant cuttings, including woody, herbaceous, and flowering ornamental species, vegetables, fruit trees and small fruits. Check out this quick reference guide on how to take a cutting or watch the video below. Take a look at this informational video on how to clone plants. Clonex Rooting Gel Is EPA Registered! © 2019 Hydrodynamics International. All Rights Reserved.